On Tuesday, May 29th, CFPA co-sponsored and participated in a rally by the NJ Poor People's Campaign. For 40 days, the Poor People's Campaign is holding weekly rallies and direct actions. This week's theme was the war economy and the proliferation of gun violence. CFPA's Executive Director, the Rev. Robert Moore, gave an introductory speech for the rally. "After complaining for years that it was starved for cash, the Pentagon now says it may have more money than it can possibly spend. The windfall is due to a budget deal between Congress and the White House last month that promises an added $80 billion for defense this fiscal year, including a requested $19.6-billion hike for "operations and maintenance" — an all-purpose Pentagon account used to fund troop training, ammunition, maintenance of tanks, warplanes and ships, and other daily needs. Defense Secretary James N. Mattis pushed for a sharp increase in the account this year, arguing that years of budget wrangling had degraded the military's readiness to wage war. Congress is still finalizing 2018 appropriations levels for the Pentagon, a delay that has generals and admirals worried about spending all the promised cash in the five months remaining before the end of the fiscal year. "We have a year's worth of money … and five months to spend it," Gen. Glenn Walters, assistant commandant of the Marine Corps, said at a Senate Armed Services Committee budget hearing. Critics say that giving the military more money than it can absorb invites waste and abuse, noting that the Pentagon has a long history of overpayments, cost overruns and fiscal shenanigans. "They cried wolf and now they have more than they can possibly put to use," said Mandy Smithberger, director of the Center for Defense Information, a policy organization critical of Pentagon budget practices. "I think it's dangerous because you are going to see a use-it-or-lose-it kind of spending."" (Read full article here). You wouldn’t know it, based on the endless cries for more money coming from the military, politicians, and the president, but these are the best of times for the Pentagon. Spending on the Department of Defense alone is already well in excess of half a trillion dollars a year and counting. Adjusted for inflation, that means it’s higher than at the height of President Ronald Reagan’s massive buildup of the 1980s and is now nearing the post-World War II funding peak. And yet that’s barely half the story. There are hundreds of billions of dollars in “defense” spending that aren’t even counted in the Pentagon budget. Under the circumstances, laying all this out in grisly detail -- and believe me, when you dive into the figures, they couldn’t be grislier -- is the only way to offer a better sense of the true costs of our wars past, present, and future, and of the funding that is the lifeblood of the national security state. When you do that, you end up with no less than 10 categories of national security spending (only one of which is the Pentagon budget). So steel yourself for a tour of our nation’s trillion-dollar-plus “national security” budget. Given the Pentagon’s penchant for wasting money and our government’s record of engaging in dangerously misguided wars without end, it’s clear that a large portion of this massive investment of taxpayer dollars isn’t making anyone any safer. (Read Complete Article). When Donald Trump wanted to “do something” about the use of chemical weapons on civilians in Syria, he had the U.S. Navy lob 59 cruise missiles at a Syrian airfield (cost: $89 million). The strike was symbolic at best, as the Assad regime ran bombing missions from the same airfield the very next day, but it did underscore one thing: the immense costs of military action of just about any sort in our era. (Read Complete Article). Will reducing military spending leave America vulnerable to attack? The defense budget can and should be reduced without presenting any risk to our country. The United States is Number 1-But in What? American politicians are fond of telling their audiences that the United States is the greatest country in the world. Is there any evidence for this claim? Click here to read complete article. American politicians are fond of telling their audiences that the United States is the greatest country in the world. Is there any evidence for this claim? Well, yes. When it comes to violence and preparations for violence, the United States is, indeed, No. 1. In 2013, according to a report by the Stockholm International Peace Research Institute, the U.S. government accounted for 37 percent of world military expenditures, putting it far ahead of all other nations. (The two closest competitors, China and Russia, accounted for 11 percent and 5 percent respectively.) From 2004 to 2013, the United States was also the No. 1 weapons exporter in the world. Moreover, given the U.S. government’s almost continuous series of wars and acts of military intervention since 1941, it seems likely that it surpasses all rivals when it comes to international violence. Especially in light of difficult economic times, CFPA considers the formation of a peace economy to be one of our top priorities. Creating a peace economy entails investing funds in domestic projects such as healthcare, education, and employment programs rather than on military endeavors. In 2012, 51% of the federal budget went to military spending. Meanwhile, only 38% of the budget was split among Human Resources, which includes Health Services, the Education Department, Housing and Urban Development, and the Labor Department. Military spending comes to about $5,862 per US household. CFPA advocates a shift in priorities in US spending, and supports projects that work to achieve this goal, such as the regional Smart Security Campaign and the national New Priorities Network. Our country is now presented with a choice between guns and butter: do we invest in our military, or do we invest in jobs and education? Our future depends on this decision, and CFPA is one of the organizations leading the way in advocataing for a more responsible and sustainable type of spending. Sample Peace Economy Resolution - Please adapt and use in your own community! Support the RISE and WORK Acts & Campaign! As of July of 2013, the Coalition for Peace Action is an endorser of the RISE and WORK campaign, an anti-poverty campaign focused on developing and advocating for national legislation to strengthen social welfare programs. We encourage you to read about these exciting efforts and add your name or organization to the list of endorsers! April 2013: CFPA holds its Annual Tax Day penny poll, which again demonstrates that Princeton residents want to see their tax dollars directed towards domestic needs rather than military spending. 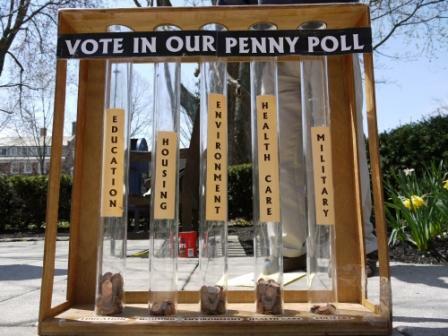 CFPA also holds the Penny Poll at Communiversity. June 21, 2012: Philadelphia City Council passes a resolution to redirect military spending and fund our communities! CFPA's Main Line chapter was an integral part of the resolution campaign. November 21, 2011: CFPA's Buxmont chapters deliver over 300 postcards to Senator Toomey's office urging the Senator to cut military spending in the Super Committee. November 17, 2011: CFPA co-sponsors a Jobs for the 99% Rally at the Trenton State House steps on 11/17 as part of a National Day of Action. 200 people attend the rally. November 12, 2011: 32nd Annual Conference and Interfaith Service for Peace entitled Smart Security: Reducing Military Spending to Fund Urgent Needs at Home is attended by 400 at Princeton University on 11/13. November 6, 2011: CFPA co-sponsors a jobs creation panel with Nobel Laureate and Princeton economist Paul Krugman, Carol Gay, and Larry Hamm attended by 500 in Princeton. October 18, 2011: Pittsburgh City Council unanimously passes a resolution to bring the troops and our war dollars home! Thanks to Jo Schlesinger for her great work on this project! June 18, 2011: 200 people attend CFPA's 30th Anniversary Membership Dinner, keynoted by Rep. Barney Frank. Rep. Frank speaks on the need for cutting military spending and the creation of a peace economy. April 16, 2011: CFPA participates in a workshop and discussion entitled "The Federal Budget Crisis: Why It Matters," which was sponosred by many progressive groups around the Philadelphia area. The discussion focuses on reducing military spending and addressing urgent needs at home. January 28, 2011: CFPA participates in a panel with the Progressive Democrats of America as they start their state tour. The Panel includes Philadelphia Jobs for Justice, US Labor Against the War, Healthcare for All Pennsylvania, and Social Security Works. Bill Deckhart, our Southeastern Pennsylvania coordinator, represents CFPA. Jo Schlesinger represents CFPA when the tour stops in Pittsburgh on 2 days later. December 14, 2010: CFPA holds a Peace Economy workshop with Mike Prokosh of the New Priorities Network. Mr. Prokosh discusses the importance in building relationships between various groups to press for a new spending policy, and the importance of creating jobs that are good for employees, customers, and the environment. October 30, 2010: CFPA co-sponsors a Town Meeting for Jobs Not War in Philadelphia. The meeting consists of a large panel of speakers who discuss ways to redirect military spending and create good jobs at home. May 25, 2010: CFPA's Main Line chapter has a viewing of "Plunder: The Crime of Our Time," a movie which details how dishonest corporate practices led to the recent financial collapse. November 15, 2009: CFPA holds its 30th Annual Conference with the theme A Peace Economy for the US and the World. The conference focused on the impact of the military budget and its relation to the economic crisis, and how portions of that money could be re-allocated for peaceful purposes. Dr. Lawrence Korb, Bill Hartung, Larry Hamm and Rabbi Michael Lerner all spoke at the conference. Every April, CFPA holds a Tax Day Penny Poll in front of the Palmer Square Post Office. Those passing are given 10 pennies which they can divide among tubes that represent five categories of federal spending: education, health, environment, housing, and military. After participants divide up their pennies, we give them a pie chart showing how their federal tax dollar is actually spent, urging them to contact their federal representatives if their priorities are different from the chart. We then let the area media know the outcome of the Penny Poll. Click here to read the "NewPeople Newspaper," which includes an article by CFPA Western PA Coordinator Jo Schlesinger on a "Bring US Troops and the War Dollars Home" resolution recently passed by the Pittsburgh City Council (p. 6). An assessment from the Project for Defense Alternatives: "The Pentagon and Deficit Reduction"
The War Resisters League's Pie Chart showing where your 2011 income taxes will really go. A video of the Sustainable Defense Task Force's report on how Pentagon spending may be contributing to the deficit. A list of deficit reduction propsals compiled by the Center for Arms Control and Non-proliferation. Data from Global Issues on US military spending in the context of world military spending. "Why We Must Reduce Military Spending" by Reps. Barney Frank and Ron Paul. "Path to a Peace Economy" by David Korten.